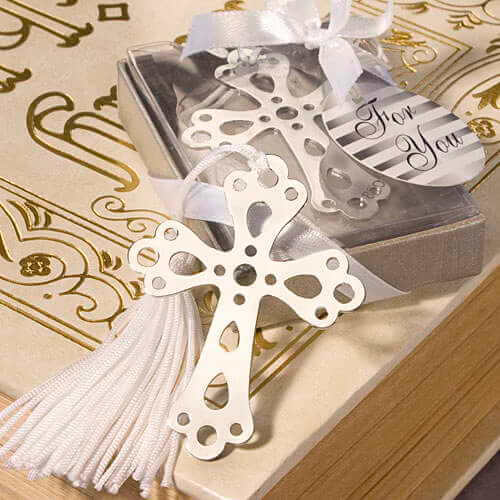 Whether it be for a Wedding, First Communion, Christening, Baptism or another special event, our silver cross bookmark favours will make a lasting impression on a day filled with blessings. Measuring 14cm (including the tassel) x 4cm, each has a silver metal cross charm with cutout details and an attached white tassel that peaks out of the book for easy page finding. Useful and elegant, each comes packaged in a clear topped box with a silver base, tied with a white satin bow and an attached round “For You” tag with a silver and white striped design. Lovely quality product, great communication and speedy delivery.